11 more selections from rock's vast catalog to learn on piano. 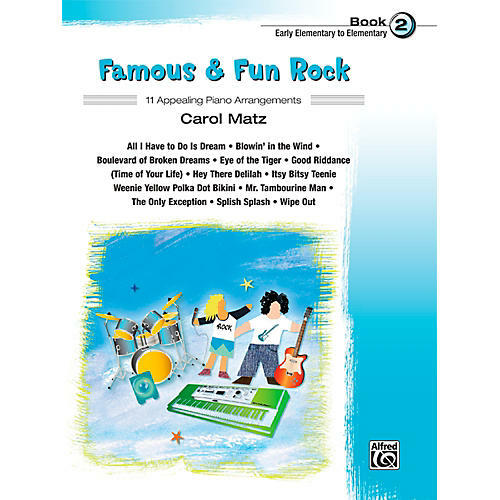 Famous & Fun Rock, Book 2 is a collection of appealing arrangements of familiar songs that students are sure to know and love. Written at the early elementary / elementary level, it may be used as a supplement to any method. The optional duet parts for teacher or parent add to the fun! Titles: All I Have to Do Is Dream * Blowin' in the Wind * Boulevard of Broken Dreams * Eye of the Tiger * Good Riddance (Time of Your Life) * Hey There Delilah * Itsy Bitsy Teenie Weenie Yellow Polka Dot Bikini * Mr. Tambourine Man * The Only Exception * Splish Splash * Wipe Out. Learn how to tickle the ivories with these classics. Order today!